The director and main cast members of the forthcoming sequel to the 2017 box-office smash "Along With the Gods: The Two Worlds" will visit Taiwan to promote the film ahead of its release early next month, the film's local distributor said Friday. Director Kim Yong-hwa and actors Ha Jung-woo, Ju Ji-hoon, Kim Hyang-gi, Ma Dong-seok, Kim Dong-wook and Lee Jung-jae will leave for Taiwan on Aug. 5 for a four-day trip, Lotte Entertainment said. In Taiwan, they will attend a red carpet event, a press conference and separate promotional activities for film reporters and industry workers from 10 Asian countries, including Japan, Singapore, Malaysia, Indonesia, Thailand and the Philippines. "Along With the Gods: The Last 49 Days" is set to open in Taiwan on Aug. 8 and later that month in Hong Kong following its premiere in South Korea on Aug. 1. In the sequel, the three grim reapers are about to gain new life as promised by the King of Hades if they succeed in reincarnating one more of the dead. 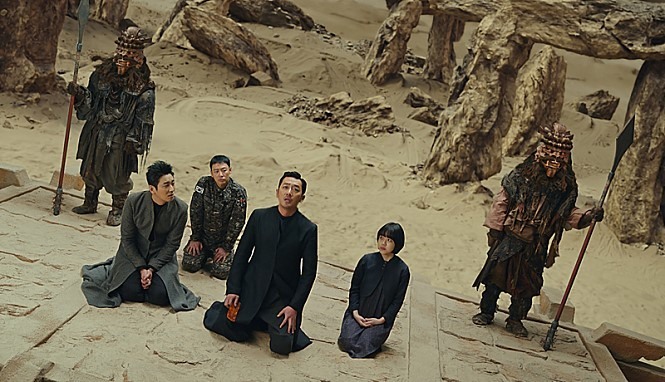 But things get complicated as Gangrim, the leader of the three, seeks to give rebirth to the man who became a revengeful ghost after being killed in a military accident in the first film against the rules of the afterlife.